Self-reported quality of life has been positively associated with measures of spirituality, such as a perceived connection with the divine  and private religious practice . It has been suggested that spirituality may confer quality of life benefits independent of other factors , but most published work has focused on spirituality’s connection with specific health outcomes rather than with global measures of quality of life. Indeed, the literature is replete with studies linking spirituality to various health outcomes. For example, it has been reported that religious individuals have a lower risk for morbidity and mortality [4, 5] and tend to perceive themselves with less disability than do less religious individuals . However, despite these findings and a growing attention to spiritual matters in healthcare, relatively little has been published on likely explanatory mechanisms underlying such relationships. Self-efficacy is a construct that has been suggested as a mediator of the relationship between spirituality and well-being. It has been speculated that spirituality may help some individuals to “gain a sense of control over their lives” . The possibility of mediation by self-efficacy or control constructs in general has long been supported, even if implicitly, in the literature [1, 8–10] and echoes the ideas of spiritual modeling and “partnered proxy agency” suggested by Bandura , yet empirical investigation of this hypothetical association is lacking. Efficacy-mediated models have been empirically tested and validated in another context, however. Research published by McAuley, Konopack, Motl, Morris, Doerksen, and Rosengren  demonstrated support for a model in which self-efficacy mediated physical activity’s effects on quality of life. In their study, McAuley et al. operationalized mental and physical health status as proximal indicators of global quality of life. They found that the direct relationship between physical activity and health status was rendered non-significant when self-efficacy was introduced into the model, thereby demonstrating mediation by self-efficacy. Subsequent research has found support for a similar efficacy-mediated model of the relationship between physical activity and quality of life . Thus, evidence exists to support self-efficacy as a reliable mediator of physical activity’s influence on quality of life. When examining the relationship between spirituality and quality of life, others have positioned health status as a mediating variable . Although the authors cited others’ work with factors such as health behaviors and self-care agency in the context of their discussion of the spirituality-quality of life relationship, that study did not include specific measurement of these constructs. Thus, there is theoretical support in the literature for self-efficacy as a mediator of both physical activity’s and spirituality’s effects on quality of life, but this relationship has yet to be explicitly tested. To address this question in the present study, we attempted to replicate the model of the physical activity and quality of life relationship first published by McAuley and colleagues , expanded here to examine self-efficacy as a mediator of the association between spirituality and quality of life. For both physical activity and spirituality, the influences on quality of life were hypothesized to operate through both self-efficacy and physical and mental health status. Adults ages 50 years and above were recruited from the local community through electronic mail, newspaper advertisements, snowball sampling via previous research participants, and announcements made and flyers distributed in local religious and community centers. Individuals volunteering to participate were deemed eligible if they were willing and able to complete paper-and-pencil questionnaires and wear an accelerometer for one week, were 50 years of age or older at time of contact, and were able to pass a basic cognitive screening  to ensure validity of questionnaire responses. A total sample of 215 individuals provided data. Participants were primarily female (n = 164, 76.3%) and White/Caucasian (n = 191, 88.8%) and ranged in age from 50–84 years (M age = 66.55 years ± 9.44). Demographic data from the study sample are presented in Table 1. Quality of life was assessed using the Satisfaction with Life Scale (SWLS) , a 5-item scale developed to assess global life satisfaction across various age groups. Each scale item is rated on a 7-point scale from strongly disagree (1) to strongly agree (7), with higher scores representing greater life satisfaction. This instrument has been used as a quality of life measure in a number of investigations involving physical activity and older adults [12, 17]. The 12-Item Short Form Survey (SF-12) , a shortened version of the Medical Outcomes Study SF-36 Health Survey , was developed out of a need for brevity in large-scale health studies that could not be met with the larger SF-36. In the current study, the Mental Health and Physical Health summary scores were used as measures of mental and physical health status, respectively. Social support was measured using an abbreviated version the Social Provisions Scale , which assesses 6 different social provisions in accordance with previous work on the subject by Weiss : attachment (i.e., emotional support), social integration (i.e., existing social network), reassurance of worth reliable alliance (i.e., tangible aid), guidance, and opportunity for nurturance. The Lifestyle Physical Activity Self-Efficacy Scale (LSE)  was designed to assess confidence in one’s ability to accumulate 30 minutes of physical activity on 5 or more days of the week for incremental one-month periods, from one month to six months. In the present study, the LSE was used as a measure of self-efficacy specific to physical activity. The Self-Care Self-Efficacy Scale (SCSE)  assesses an individual’s confidence in his or her ability to cope with self-care challenges due to a situation such as illness. With the permission of the developer (Dr. Lev), the scale was modified for use in the current study by replacing language specific to illness with language referring to the aging process in general. The original measure has demonstrated evidence of validity in previous studies . Physical activity data were collected using the Actigraph portable accelerometer (Actigraph, LLC, Pensacola, FL). The Actigraph accelerometer has been shown to provide valid assessments of physical activity level in adult men and women during treadmill walking, running and daily activity [24, 25]. Previous work has demonstrated that the Actigraph accelerometer accurately predicts energy expenditure and demonstrates superior reliability when compared with other accelerometers [26, 27]. Actigraph data in the present study are reported as the total number of activity counts per day, averaged across a three-day period. A model in which spirituality, social support, and physical activity influenced hierarchical quality of life in a parallel fashion was specified in a path analysis using Mplus version 3.21 covariance modeling software . Model-to-data fit in the current study was evaluated using the chi-square test  and root mean square error of approximation (RMSEA)  statistics in combination with the comparative fit index (CFI) and standardized root mean square residual (SRMR), which are accepted indicators of model-data fit [30, 33]. The strength of relationships between study variables was estimated using standardized path coefficients. The hypothetical model provided a good fit to the data according to traditional structural equation modeling fit indices (χ 2 = 33.10, df = 16, p < .01; RMSEA = .07; SRMR = .05; CFI = .94). Significance in the chi-square statistic, which is generally indicative of a poor-fitting model, is typically tolerated in evaluating the fit of hypothesized models in data sets containing a large number of observations . The hypothetical model tested in this study, which can be seen with standardized path coefficients in Figure 1, accounted for significant variance in quality of life scores (R2 = .35). 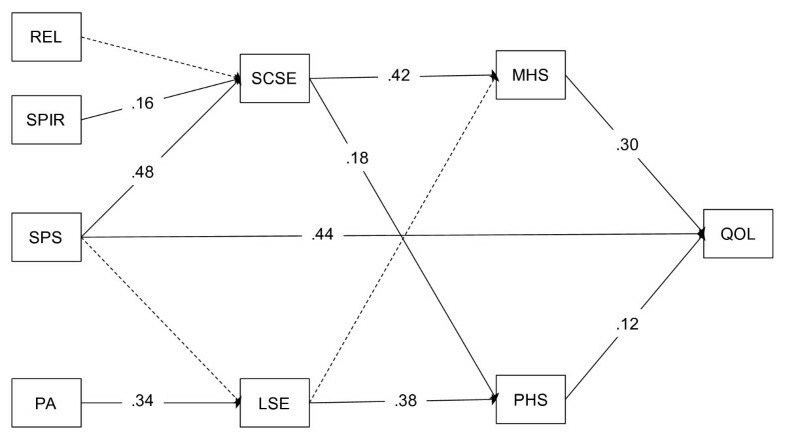 Model results depicting observed paths among study variables. REL = religiousness, SPIR = spirituality, SPS = social provisions, PA = physical activity, SCSE = self-care self-efficacy, LSE = lifestyle physical activity self-efficacy, MHS = mental health status, PHS = physical health status, QOL = quality of life. Physical activity, social support, and spirituality each accounted for significant variance in associated self-efficacy constructs, with standardized path coefficients (βs) of .34, .48, and .16, respectively. These efficacy constructs, in turn, accounted for significant variance in mental and physical health status, confirming initial study hypotheses. These results were similar to those observed by McAuley and colleagues , with the exception that physical activity self-efficacy was moderately associated with physical health status (β = .38) but not mental health status (β = .10). The efficacy-mediated influence of spirituality was observed to be stronger for mental health status (β = .42) than for physical health status (β = .18). Thus, more spiritual individuals reported greater self-care self-efficacy, which, in turn, was associated with more positive health status. This association was stronger with mental health status than with physical health status. In addition to its effects on self-efficacy, social support was observed to maintain a statistically significant direct relationship with global quality of life (standardized path coefficient = β = 44), indicating the quality of life benefits derived from social provisions, above and beyond the effects of physical activity and spirituality. The results of this study provide further support for previously proposed efficacy-mediated models of physical activity and quality of life [12, 13]. More importantly, the results reported here provide initial evidence for the extension of McAuley et al.’s  hierarchical, social cognitive model to understanding the association between spirituality and quality of life. Specifically, our data suggest that spirituality may exert an influence on health and well-being in a path that, like physical activity, is mediated by self-efficacy. In our best-fitting model, spirituality exhibited a stronger connection with mental health status than with physical health status. These results are similar to the findings of Sawatzky and colleagues , who, in their study of spirituality among adolescents, also found mental health status to mediate the association between spirituality and quality of life. Our data suggest that spirituality’s influence on quality of life operates largely through mental health status, and physical activity’s influence on quality of life is chiefly through physical health status. Although previous research has certainly supported physical activity as a mental health determinant, there is also evidence for spirituality as a determinant of physical health above and beyond the influence of psychosocial factors . Indeed, recent evidence supports our findings that physical activity’s effects on physical health status are stronger than on mental health status, and that global quality of life is more strongly influenced by mental health status . Thus, our results suggest that physical activity and spirituality are complementary determinants of quality of life, with their strongest influences on physical and mental health status, respectively. We also observed a direct path between the provision of social support and perceptions of global quality of life that was significant above and beyond the effects on self-efficacy (β = .44), as shown in Figure 1. Others have similarly found social support to be an important variable to consider when examining the extent to which spirituality influences health outcomes. For example, an investigation of quality of life among Korean and Korean American breast cancer survivors resulted in social support for the mediating influence of spirituality, but only for Korean Americans . At present, it appears that some of the quality of life benefits derived from spirituality are due to increases in social support, yet the manner in which social support operates in a hierarchical model of quality of life may differ across populations. Certainly, social support remains an important determinant of quality of life , and future research in this area is warranted. Programs and services designed to improve quality of life among older adults are needed as the population in the United States continues to face increasing age-related challenges to health and functioning. Targeting a modifiable construct like self-efficacy may help, in this respect . The results of the current study provide additional support for the mediating role of self-efficacy perceptions in the determination of health status and global quality of life. Our data tentatively suggest that programs designed to promote physical activity and feelings of spirituality – but not necessarily religiousness – will likely have a greater impact if they also target self-efficacy. The current study was not without its limitations, one of which was the small number of racial minorities that took part in the study. Despite concerted efforts to recruit an ethnically diverse sample over the course of the study, small numbers of minorities participated. Minority participants lower scores on lifestyle self-efficacy, social provisions, and satisfaction with life, as can be seen in Table 2. An insufficient number of minorities precluded our examination of whether racial status influenced the strength of the paths in our model, so further work is needed to examine might possibly moderate these relationships. Some diversity was observed with respect to the religious affiliation of participants, with 21 individuals (9.8% of the sample) reporting affiliation with a religion outside of Judeo-Christianity (e.g., Buddhism, Hinduism, others), 8 participants (3.7%) identifying themselves as atheist or “none,” and another 8 participants (3.7%) identifying themselves as Jewish. Still, 31 individuals (14.4%) identified themselves as Catholic, and 147 (68.4%) reported affiliation with other Christian denominations. Thus, future research is needed to ascertain whether the relationships among variables reported in the current study among older adults exist among even populations with greater diversity with respect to age and religious affiliation. Although the path analysis reported here corroborated and extended existing research, the data were cross-sectional, thereby limiting the extent of our ability to draw causal inferences. One final question that remains is that of which efficacy measure to use. It is clear from the results in this study that religiosity was not related to self-care self-efficacy. Yet, in the religiosity literature, control constructs are repeatedly suggested to mediate the beneficial aspects of religiosity on health and well-being outcomes. If, as Bandura  suggested, this can be explained by “partnered proxy efficacy,” the question becomes: Self-efficacy with respect to what, if not self-care? The challenge remains to precisely determine which control constructs are driving the effects of spirituality on well-being. The data presented here provide support for a hypothetical model in which self-efficacy mediates the relationship between physical activity and quality of life. Moreover, evidence was also provided for a similarly structured, efficacy-mediated path between spirituality and quality of life. Thus, it appears that control constructs such as self-efficacy account for some portion of the quality of life benefits derived from both spirituality and physical activity. Further investigation of these relationships, particularly the influence of spirituality on health and quality of life outcomes, is needed. Funding for this study was provided by National Institute of Mental Health Pre-Doctoral Fellowship #1F31MH076460-01. Edward McAuley is supported by a Shahid and Ann Carlson Khan Professorship in Applied Health Science and a grant from the National Institute on Aging (5R01 AG20118).